Poetry Explosion! is a book like no other. It is going to be written and illustrated by Emily Joshua, but inspired by YOU! All you have to do is suggest the subject for a poem. It can be anything you like: from a humorous subject, to serious, from topical to philosophical, even from Brexit to beans on toast! 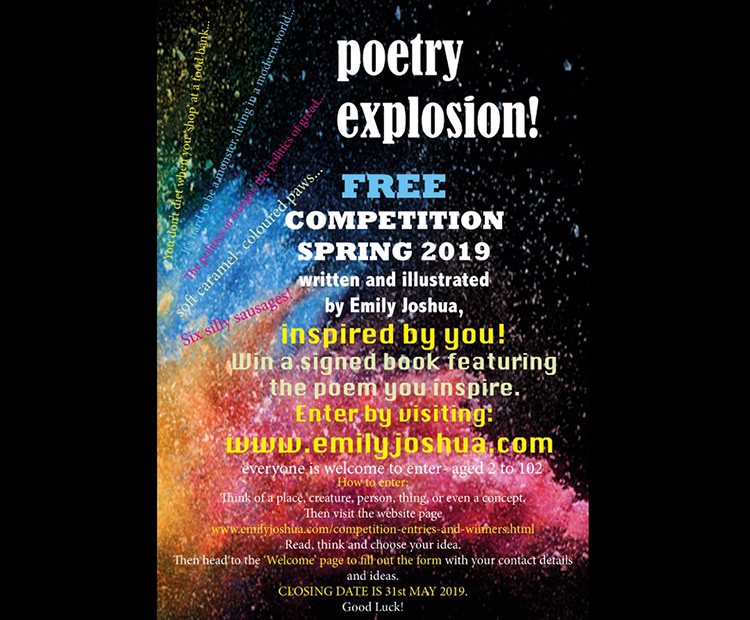 If your entry inspires a poem, not only will the poem go into the book, but it will also be illustrated (and you will be named as the ‘muse’ unless you ask to be anonymous) and you will be sent a signed copy. This year also signifies the 60th Anniversary of North Cornwall being an Area of Outstanding Natural Beauty, so one section will tie in with Magical Moments 2019 in celebration of that event. Who can enter? Everyone and anyone and you can send as many ideas as you would like. The competition is easy to enter: simply head to the website and go onto the competition entries and winners page for all the information, then fill out the form on the welcome page to send your entry off. COMPETITION ENDS 31st MAY 2019.